Two weeks ago today, I got a new car. For a while, I had my heart set on a Honda Insight. I like how it looks on the outside, but I had never been inside of one. So my sister and I went to a Honda dealership near my house and sat in one. And I hated it. I got in and was trying to force myself to like it, but I just didn’t. And we could barely sit in the back seat. We’re too tall I think, but I doubt that even two Christines and a Lily could fit back there. It was horrible. But that made my decision much easier. As much as I love the color that the Insight comes in, which has since been changed from “Tango Red Pearl” to “Crimson Pearl,” I knew that I definitely did not want an Insight. It was weird though, because all this time I was convinced that that was my perfect dream car, until I actually sat in one. There’s a life lesson tucked in there, but I’ll leave that for you to figure out. My second choice car had recently become a Toyota Yaris. I like hatchbacks (a Yaris “hatchback” is actually called a liftback, but I digress), and they’re so small and cute. My dad had already been looking into deals on the Yaris, so before we went to the Honda dealership, my sister and I went to a Toyota dealership, since I had never been inside a Yaris either. The night before, I had been reading things about the Yaris, and a lot of what I found was not very positive–the main issue being that the inside feels “cheap.” It is a pretty inexpensive car, after all. But when we sat in the Yaris, I really liked it. The back seat is even pretty roomy. It definitely looks smaller on the outside than it feels on the inside. 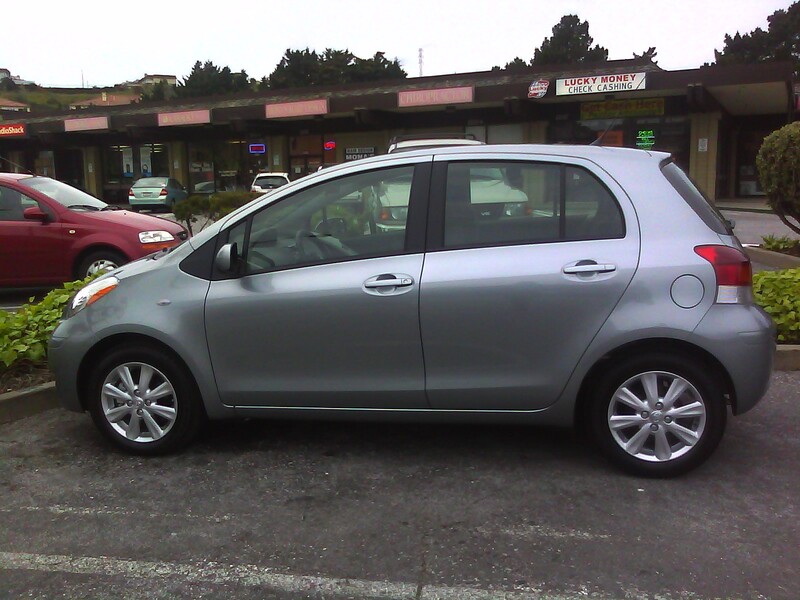 So anyway, since I had decided that I wanted a Yaris, I then had to decide what color to get. Cranberry is always my first choice in a color for anything, but the 2011 Yaris doesn’t come in that color. My choices were Blazing Blue Pearl, Absolutely Red, Black Sand Pearl, or Meteorite Metallic. I had never seen any of them in person; only online, and so I was very torn. But when we got to the dealership, I was so surprised by how much I did not like the red or the blue and by how much I did like the Meteorite Metallic, which is kind of like a blueish-greenish silver. So there we go. p.s.-i'm happy to be considered a unit of measure.